Here was one of the first jobs I done to the car. This was before the “One man and his Mustang” blog even crossed my mind so there were no before and after pictures as such. Just these here how she arrived. I removed the gas tank and coated the rear frame with POR15 (same sequence as above) to stop surface rust appearing here too. The left hand side rear quarter panel and rear housing will be replaced, the right hand side will again be treated on the car and sealed properly with some POR 15 Anti rust paint. Some of the new wire loom can be seen hanging out at this point before I neaten it all up. 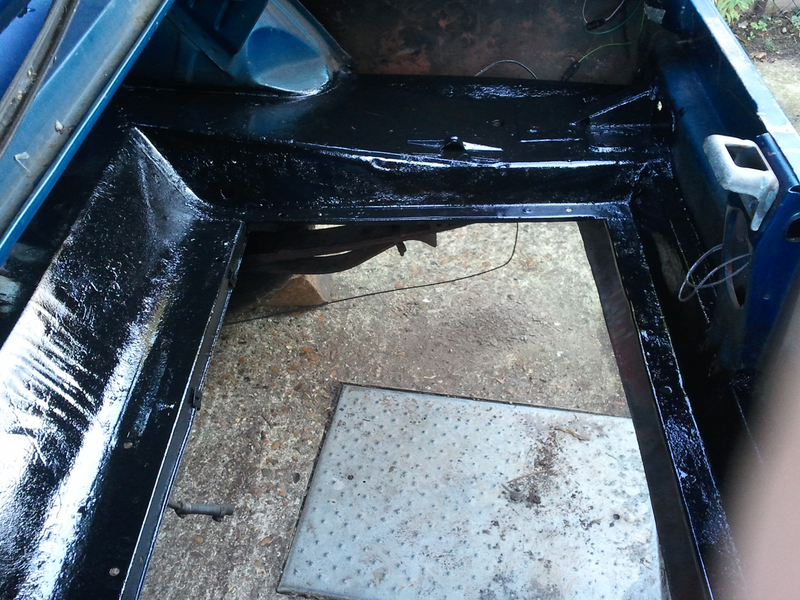 I treated the stainless steel Gas (petrol) tank with a smooth Hammerite black as well to stop any issues. which I will remove near the time it’s refitted. A lot of the trunk work revolves around the rear quarter panels that need to be braised to the roof and cut off in stages. I will not cover that part here as another photo section will show that process. Click here for the quick link. The seat panel that drops to the fuel tank was peppered with holes and needed to be replaced. The replacements are very angular and not curved like the original. So the guys fabricated a new one copying the old shape. The rear quarters were removed as well in order to get to the parts that needed doing. The Trunk drop sides were cut away as the rear chassis legs were rotten and needed to be replaced. Replacement drop sides were added over the new rear chassis legs, See Chassis Under Seal & Floor Pans or click here for the quick link. With the drop sides in place the new fabricated parts needed to be welded in place and the welds removed from the top sections of the drop sides. Seam sealer was applied and the inner wheel arches needed to be stripped down n order to take some base coat and final colour paint. With the rear quarters removed, outer wheel arches, tail lights and rear valance removed the inside of the trunk was sprayed with a high fill primer. The forward part of the wheel arches were not sprayed with white as they would not be seen from inside the car. The red oxide would provide the protection there just the original cars did. During this time my home work was to strip down the trunk hinges and flex bars to hold the trunk open. I again done these at home with stripper and coarse wire wool to remove the layers of paint. The cleaned up parts were taken back to Mustang Maniac and were sprayed ready to go back into the trunk. and sprayed with top coat. The main trunk lid was next on the list to be stripped down. Same old procedure here of stripper, scrapper and wire wool to be repeated as many times as required to get back to bare metal. The trunk metal work would be a guide for the rear quarter panels to be fitted as you work backwards towards the front of the car. Both rear quarters and outer wheel arches need to be replaced due to the heavy rusted out sections. 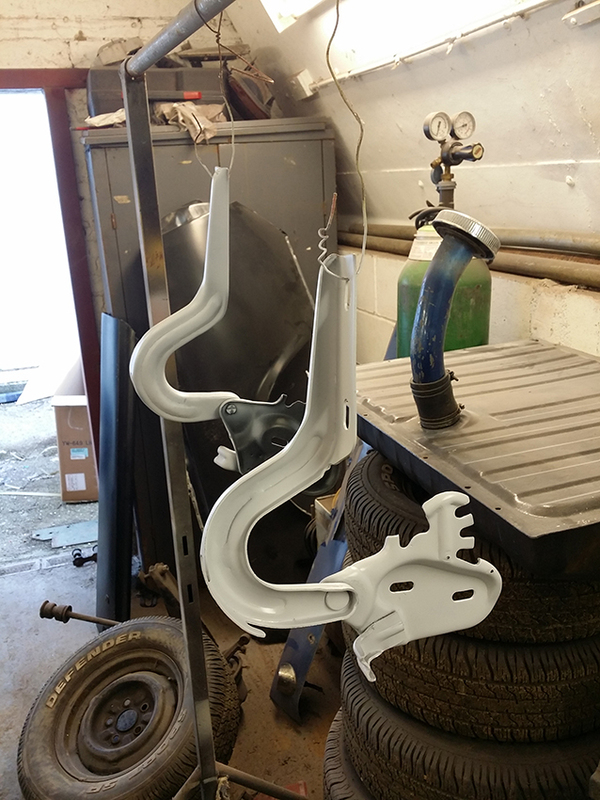 The new rear quarters were sprayed of the car and coated with under coat along with a couple of coats of top colour on the inside as the final spraying would not be able to get into the bottom of the quarter panels without the paint running and looking a complete mess. The inner arches, chassis drop sides and back of the seat was sprayed with the top colour as again this would not be able to be sprayed nicely when all bolted together. Terry gave a couple of quick layers on the inside ready for the final top coat that would be visible from the back of the car. Next the quarters were dry fitted to the rear to see how they aligned up, they would not be welded up yet until the arches had been completely aligned and spot welded into place. A lengthy process of alignment of a few millimetres here or there was required in order to make sure the quarters aligned with the wheel arches and then welded into place. The rear light panel was offered up to the quarters and the delicate procedure of adding the rain gullies in place dry fitted up. The back of the channels under the windows should always be braised in place along with the joints just above the light openings. The quarter end caps need to be fitted and make sure they align with the trunk and the light panel. Many clamps were used and dry fitting before any of the spots were put in place. The bottom of the light panel could then be welded to the truck floor mounts to introduce some strength back into the car. An old bumper was used again to align the end caps up correctly and removed before the caps were bolted back on and the light panel welded in place. One of the last stages is to fit the rear valance. The original on my car was mashed up and rotten beyond belief so a new one was required regardless. As this is only a bolt on part there was not too much work adjusting that needed to be done. With all the metal work in place the rear end section is pretty much completed. The outside of the rear quarters were treated to a very light filler to even out some imperfections.